"Soba noodles, a dish that's popular in Japan, particularly on New Year's Eve, can be difficult to get just right so that the noodles aren't too chewy or hard. But while it can be tricky for novices, it's not impossible to make by hand. All that's needed is stone-milled buckwheat flour, a plastic bag, a rolling pin and a sharp chef's knife." A master shares his easy method for making your own. "Writing became such a process of discovery that I couldn't wait to get to work in the morning: I wanted to know what I was going to say. 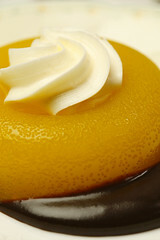 ~Sharon O'Brien (*)"
A popular Thai dessert mixes the stickiness of rice with the sweet flavor of mangoes. The rice is steamed and flavored with salt, sugar and a coconut cream sauce. If diners don't care for mangoes, pineapple or peaches make good substitutes. In Thailand, a ripe mango accompanied by steamed sticky rice enriched with coconut cream is a doubly festive dessert.